A wonderful gift idea for a special person on a special occasion - birthday, wedding, holiday, graduation, new baby - or as a remembrance for a special woman in your life. 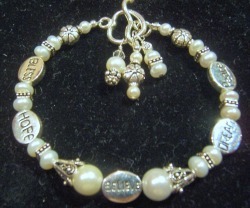 The bracelet shown here is designed with pure white Swarovski pearls, sterling silver accents, 5 sterling silver word beads (bless, hope, believe, create, hope), and my signature sterling silver heart clasp with bead dangles. These bracelets are one of a kind and made to order. Together, we'll choose the perfect combination of beads and colors and I'll design a bracelet that will exceed your expectations. Please allow three weeks for delivery. Prices begin at $50.